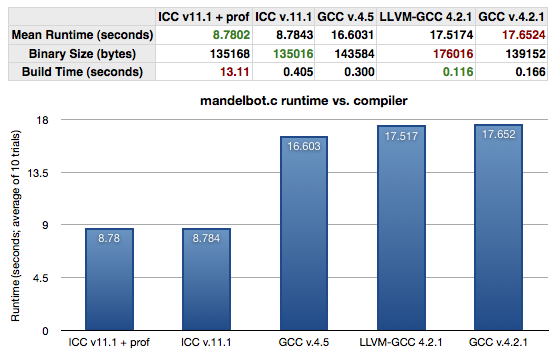 I've been hearing a lot about ICC, the Intel C/C++ Compiler, recently — especially how much better it is at optimization of math-heavy routines when compared to GCC. I generally refused to believe people when they claimed 30-50% speedups, if only because it seemed like simple hyperbole. Holy crap... a 2x speedup! Crazy crazy stuff! I realize that this is a completely unreasonable benchmark, performed under less than perfect benchmarking situations (though they were pretty good), and is not representative of "normal" code, and should not be used to pass judgement against any of the involved compilers, but it's relatively representative of the kind of code that I want to run fast. 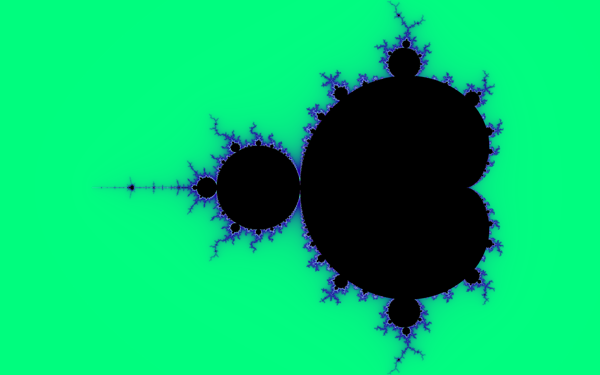 I've had long-running math-heavy programs in the past which I would have been very happy to have been able to speed up anywhere near 2x (in order to meet class project deadlines...)! I also find it funny that ICC produces both the fastest and smallest code, and that turning on profile-guided-optimization had no perceptible effect (except, obviously, to make the compile time ridiculous). I presume this is not the case in other scenarios. I should also note that all tests were done on the 2.4 GHz Core 2 Duo T7700 in my 2007-era MacBook Pro. A chip that Intel knows how to optimize for, apparently! 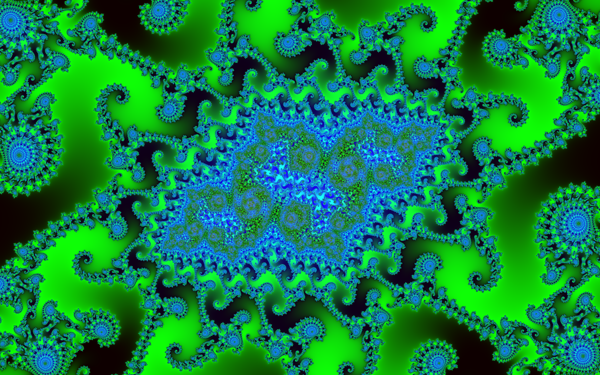 NOTE: Dad suggested that the 2x speedup might be due to autoparallelization or some such. However, luckily for my benchmark, this is not the case, as the program already takes advantage of both cores (spawning 10 threads each generating a tenth of the image), and manages to consume ~197% of the total CPU time (across two cores) over its lifetime.